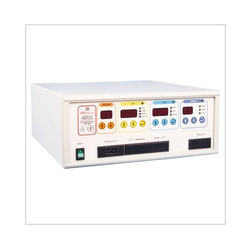 We offer wide range of Electrosurgical Cautery Units. These cautery units are quality tested and used in medical field. Made of quality raw materials, these machines are totally in sync with modern day demand for Electrosurgical Cautery Units. Electrosurgical Cautery Units are ideal to carry out monopolar and bipolar surgery with high precision and reliability especially in endoscopy. The operation modality and the output control selection are made simply by means of keys provided with iconography description. All the indications of operative condition and of selected output level are digital bright display. Looking for Electrosurgical Cautery Units ?